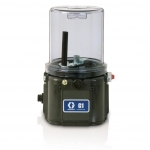 The Graco G1 Standard from MotionSource is a reliable entry level lubrication pump for your applications. Designed to eliminate manual lubrication when you don’t need all the “bells and whistles”. With your choice of 2, 4, or 8-liter reservoirs for oil or grease, there’s a size to match your system needs. The Graco G1 Standard pump comes with one pump element installed that reliably delivers lubricant when you need it. A budget friendly solution, the Graco G1 Standard pump has no internal controller, perfect for moving from manual to automated lubrication. Connect to DC (12 or 24v) and AC (90-240v) power sources with CPC or DIN-style connectors for easy, no hassle installations. With its advanced flow dynamics, the G1 Standard pump features a contoured base keeping lubricants flowing directly to the pump inlet, significantly reducing stagnant areas where grease can separate. It’s a better design that makes past issues one less worry to keeping your equipment running. Need help with service or installation of your Graco pump? MotionSource has a 24/7 full-service team ready to help with what you need, when you need it. Our service technicians are Graco trained and certified to help with your pump needs. We also specialize in programming your pump! If you just need technical help, give us a call 888-963-6686. All of our customer support team is Graco trained as well. MotionSource is your Source for Graco G1 Standard pumps!